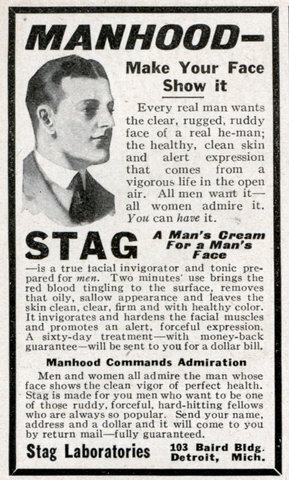 Every real man wants the clear, rugged, ruddy face of a real he-man; the healthy, clean skin and alert expression that comes from a vigorous life in the open air. All men want itâ€” all women admire it. You can have it. â€”is a true facial invigorator and tonic prepared for men. Two minutes’ use brings the red blood tingling to the surface, removes that oily, sallow appearance and leaves the skin clean, clear, firm and with healthy color. It invigorates and hardens the facial muscles and promotes an alert, forceful expression. A sixty-day treatmentâ€”with money-back guaranteeâ€”will be sent to you for a dollar bill.